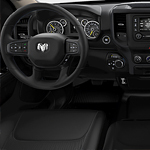 Ram 1500: Making Your Driving Experience Safer | Crowfoot Dodge Chrysler Inc.
Ram 1500, a popular light-duty pickup, is known for its dependability as a working vehicle. It also has safety features to make your drive more secure. Even the most diligent driver can get distracted, and when that happens, it's easy to drift out of your lane. With the available LaneSense Lane Departure Warning – Plus feature, you get a visual alert when you drift, and it safely guides your car back into its proper position. Also helping you navigate the streets of Calgary is Adaptive Cruise Control with Stop and Go, which detects cars in front of you to help prevent collisions. When traffic is slow, and you need additional braking, the Forward Collision Warning with Advanced Brake Assist automatically kicks in to keep you at a safe distance. Visit Crowfoot Dodge Chrysler Inc. to get more information on the Ram 1500 or to take a test drive.